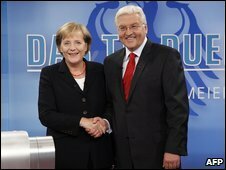 Frank-Walter Steinmeier, leader of Germany's centre-left Social Democrats (SPD), was Angela Merkel's main challenger for chancellor in this year's national elections. After exit polls suggested that his party could be heading for its worst performance since World War II, he admitted a "bitter defeat" while promising to be "vigilant in opposition". Although his centre-left SPD was the junior partner in Mrs Merkel's coalition for four years, with Mr Steinmeier serving as her deputy and the country's foreign minister, kept a relatively low profile. With the economic crisis a key campaign issue, Mr Steinmeier, 53, vowed to bring full employment to Germany, saying his party would create four million jobs by 2020. Recent jobs figures suggest nearly 3.5 million people are unemployed in Germany - Europe's largest economy - and economists say that figure could rise by as much as one million in the next year. His party condemned Mrs Merkel's campaign pledge to cut taxes as a "tax gift" giveaway, but critics say the SPD's pledges are unrealistic. Mrs Merkel made it clear she wanted to jettison Mr Steinmeier's party as governing coalition partner, preferring to link her conservative CDU party with the liberal Free Democrats (FDP). In a recent TV debate with Mrs Merkel, Mr Steinmeier said his party stood for more social justice and an end to nuclear power. But analysts suggested he appeared nervous and did not really come out fighting. As the two leaders have been in a coalition for the past four years, there was little to choose between them policy-wise in the debate, which correspondents said was more of a duet than a duel. Unlike Mrs Merkel, Mr Steinmeier favours Turkish entry into the European Union. But he shares her views on keeping German troops in Afghanistan, confronting Iran over its nuclear programme and negotiating binding goals to tackle climate change. Trained as a lawyer in Westphalia, Mr Steinmeier has been described as "friendly, fair and efficient". His role as a behind-the-scenes enforcer for former Chancellor Gerhard Schroeder gave him the experience of handling a broad range of issues. Having joined Mr Schroeder's staff in 1991, Mr Steinmeier followed the SPD leader from Lower Saxony to the Berlin chancellery in 1998. 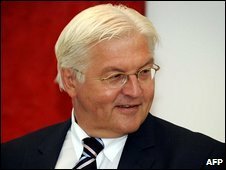 Mr Steinmeier ran the chancellery, playing a vital role as co-ordinator and mediator in Mr Schroeder's Red-Green coalition. He was involved in Germany's response to the US-led "war on terror" after the 11 September 2001 attacks and in the implementation of Mr Schroeder's controversial Hartz IV welfare reforms. He chaired talks with energy industry bosses that resulted in a deal in 2000 to phase out nuclear power, and from 2002 he helped shape the chancellor's Europe policy. Mr Steinmeier served as president of the European Council in the first half of 2007, and replaced Franz Muntefering as Germany's vice-chancellor in November that year.